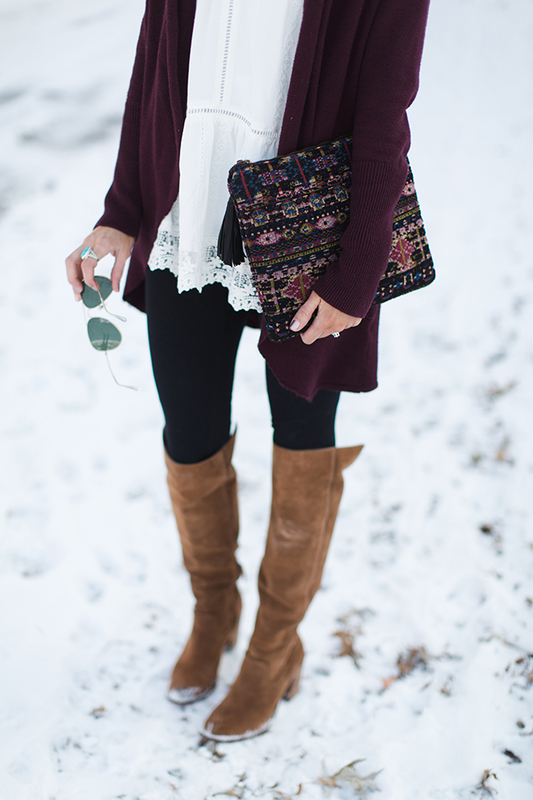 SWEATER // TOP (similar) // LEGGINGS // BOOTS // SUNNIES // EARRINGS // CLUTCH (similar) PC: Sarah Sweeney When it comes to styling clothes, I think its especially admirable when I see someone get creative with basics. Anyone can buy something and make it look cute once, but to re-wear and re-style something over and over in new ways takes a lot of extra work. This year I want to stretch myself in those ways more. I always enjoy thinking outside the box, but this year I want to get my basics in on it. If I can put together fun new-ish ways to style overalls or a basic tee then I want to do it! 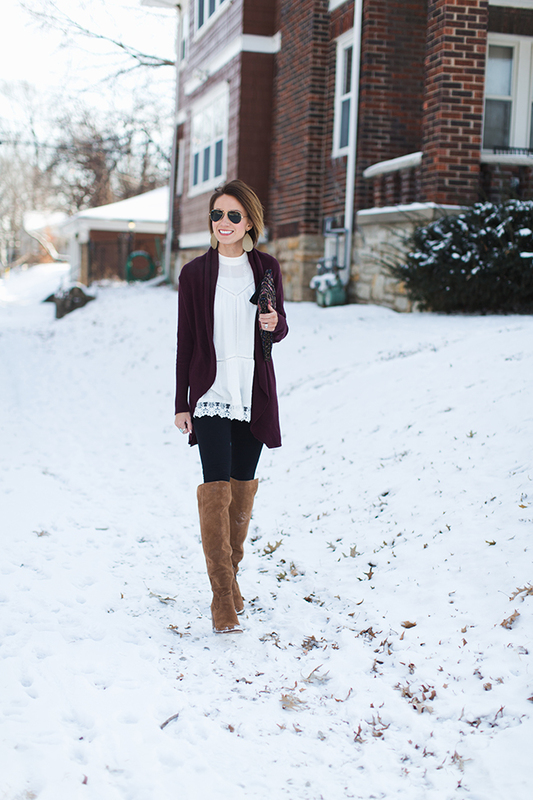 Today I'm pulling out one of my favorite lace blouses from the Summer to style in the Winter. I love a lace top or a blouse with a crocheted lace hem like this one, but typically they are easiest to wear in the spring or summer. Most of them are short sleeve and kind of scream sunny weather. But who says you can't wear one in the winter? Today I'm pairing mine with an over sized cardigan (one that covers my bum), my all time favorite leggings and OTK boots. 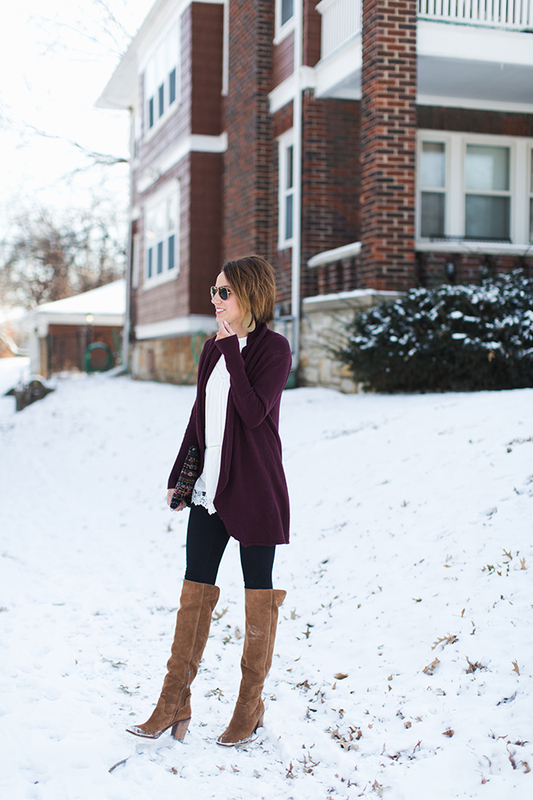 You don't lose the cute hem of the blouse and even some of the front detailing, but you do get enough layers to stay warm and bundled in below freezing temps. Another way to style this top might be with a heavy military jacket, skinny jeans and tall boots with a heel like these. My exact top is sold out, but I found this and this that are similar and you'll easily be able to style either of them right into Spring. 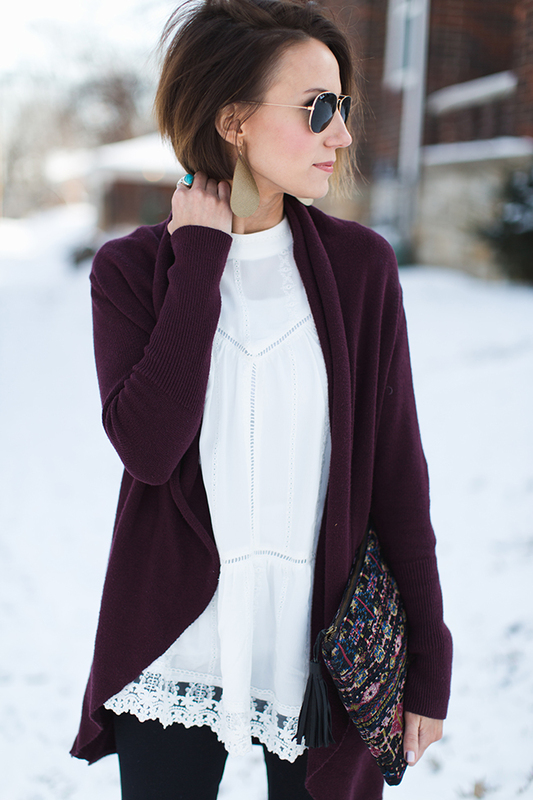 I'm so glad they restocked this cardigan and now I think I might need it in another color or two. It fits big so I sized down and got an XS. I can't say enough good things about these leggings and they fit TTS. I wear a small and prefer it over the XS. Do you have a top like this you can pull back out from Summer? Have you formed any style "resolutions"? Where is the clutch from? Did someone make it? I resolve?.. is that the right word? Well anyway, I am going to step outside of my Box when it's comes to style and fashion! Trying things where I'd normally say to myself "maybe not," but decide to go with it anyway! I'm in my element with work and it gives me awesome opportunities to see other people and get inspiration from that!